Long time lurker here. I used to have an account here a long time ago but never used it much. Loved T-birds and specifically SC's basically forever. Currently T-Birdless but started an engine project regardless for when I get one. This project started off with the idea of putting split-port heads with the M90 with a modified/custom intake manifold before it branched out into what will be 2 different projects, 1 for an eventual existing SC engine and the other a turbo 4.2. While I am Thunderbird impaired at the moment I have access to a full machine and fab shop so I can keep busy making parts and such. I started this project back in fall 2018 so I have 6 months of photos and such to get out of my system. As I mentioned it started out with the idea to mate the split-port heads to an SC supercharger setup. I found a few people online that attempted it so I figured why not, and picked up a set of low milage 2005 split-port heads from the salvage yard. Next I needed an intake manifold to start with. I decided upon on Freestar intake because it has large open ports and no EGR stuff to deal with plugging. I removed the butterflies from the intake and plugged it with a solid piece of aluminum rod and JB Weld. 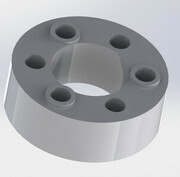 After that I needed to make the M90 mate to it so off to Solidworks I go. Here is what I came up with. After being happy with the design it was time to machine it. First I milled an inch off of the Freestar intake to open up the ports and to help with hood clearance. After that I put some 6061 aluminum in the mill and started making chips. I used HSM Works to develop the cnc programs for it. Still some finish work to do to it but it’s functional. Hood clearance will be an issue with this setup, definitely need a hood with a decent cowl on it. But as I don't have a car to put it in right now I don't need to be too concerned with it yet. Last edited by jb351; 04-10-2019 at 11:32 AM. I had seen that Morana uses Cobra throttle bodies on his custom intakes and I liked that idea because I like a challenge and because I’m cheap so I picked up one for $60 on ebay and drew up an adapter in Solidworks before hacking up the inlet plenum and tig welding the adapter to it. Lots of room for the air to flow in there now. It still needs the port work finished and it’s appearance cleaned up. Trial fit with the heads and aluminium “injector”. Houston we have a problem! I forgot to account for the injectors in my design, oops. Not all is lost though, just a bit of clearance needs to be machined into it. It was either make major mods and rework to the intake or change the injector angle so I changed the injector angle to straight up/vertical and machined new injector bungs to thread and then jb-weld into the new spots. Just a bit of clearance needed now on the middle intake needed in a couple of spots. Nothing a grinder or mill can’t handle later on. 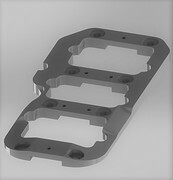 If I were to do it again I would design the clearance into the intake and not have to mess with the injector angles. Live and learn I guess. I may end up redoing the lower intake section with the added clearance down the road and replace the heads with another set. Last edited by jb351; 04-10-2019 at 01:12 PM. On to the supercharger. Nothing really special went on here. I enlarged the openings on the milling machine, cleaned it up, added some fresh oil and an internal polishing and then made a new coupling for it out of UHMW on the mill to replace the old one. No play in it now at all. 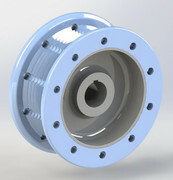 I needed some pulleys now so of course I decided to make them instead of buying them, (I mentioned I’m cheap right?). Again, off to Solidworks and then the mill and lathe to carve something out. I wanted something that is like a quick change pulley. So what I ended up with is a steel center section with replaceable outer pulley sections. I made a 10% pulley and another that has yet to be finished, it might be a 6-7.5%, I am not sure yet. 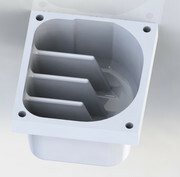 I wanted a stud girdle so once again out comes Solidworks for a design. Here is what I came up. Houston, we have a problem….again. The oil pan won’t fit over the girdle. Nothing a little more rework and machining won’t fix though. I had to lower and contour the front section to make it just barely fit under a stock oil pan. Speaking of oil pan’s. I cut out the “hump” and welded in a couple of pieces to gain some added oil capacity. I started thinking about when the time comes to get the block machined, none of the local shops will have a 3.8/4.2 torque plate. You should know by now where this is headed. 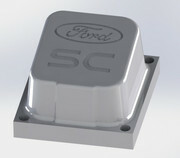 Off to Solidworks to design one and then to the mill to make it. Here is it. One last update for the day and that more or less covers all of the bigger aspects of what I've been doing for the last 6 months on it. I think I will tackle a windage tray for it next in addition to doing some finishing work and little adjustments to all the parts made so far. I started thinking about my end goals for the 4.2 and came to the conclusion that the M90 will not cut it long term nor will it fit under a stock hood with that setup so that part of the intake/project has been shelved for now and construction on a new upper was started and the 4.2 will now be a turbo engine while the modified 3.8 parts will now be going on a SC when I get one while I still work on the 4.2. A bit of body filler to smooth out the rough edges. The internal bottom "wings" on the bottom were milled out afterwards to open up the plenum. I just painted it yesterday. Last edited by jb351; 04-10-2019 at 05:54 PM.